Well it all started last week when I ventured to Home Goods in search of a full length mirror. 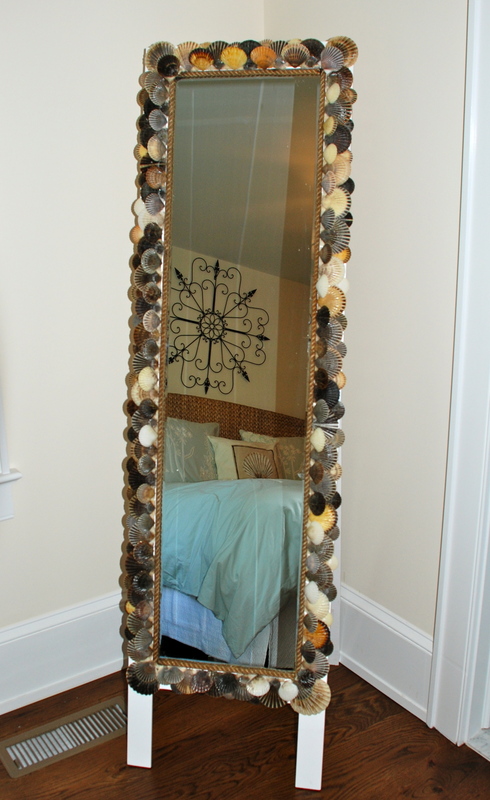 I found a great white easel mirror there for $39.99, and wasted no time setting it up in a guest room I’m redecorating. It wasn’t until I stood it up that I noticed a huge blemish in the upper right hand corner. What to do? Inspiration kicked in later that day while I was walking on the beach. 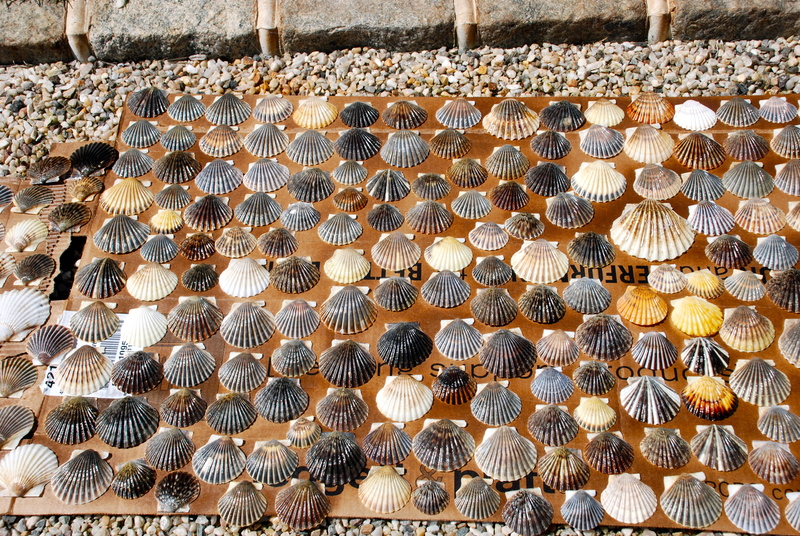 The particular beach I was on in Cutchogue had tons of beautiful scallop shells in all colors, shapes and sizes. 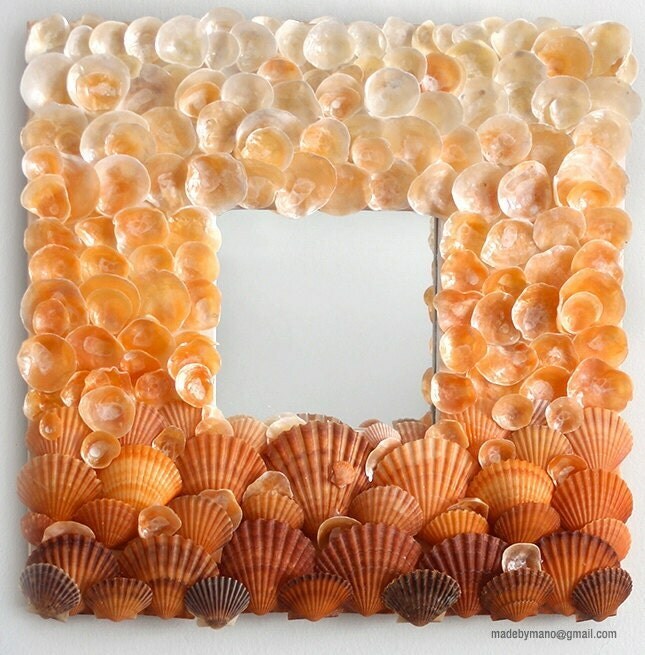 I decided right then and there I would use the shells to make over my damaged mirror. 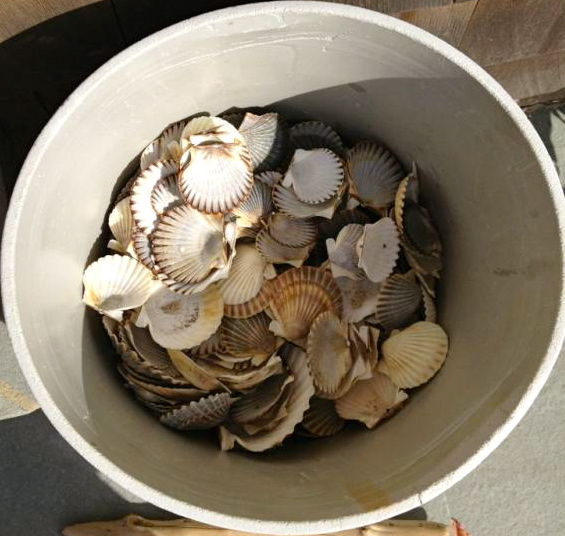 I was able to fill an entire painters bucket with shells, and get to work. Seeing as the mirror is full length, I knew I’d have to enlist help. My daughter and I laid every shell out and sprayed them with Painter’s Touch Gloss in Crystal Clear. When the shells are on the beach, they have a sort of salty, muted color. 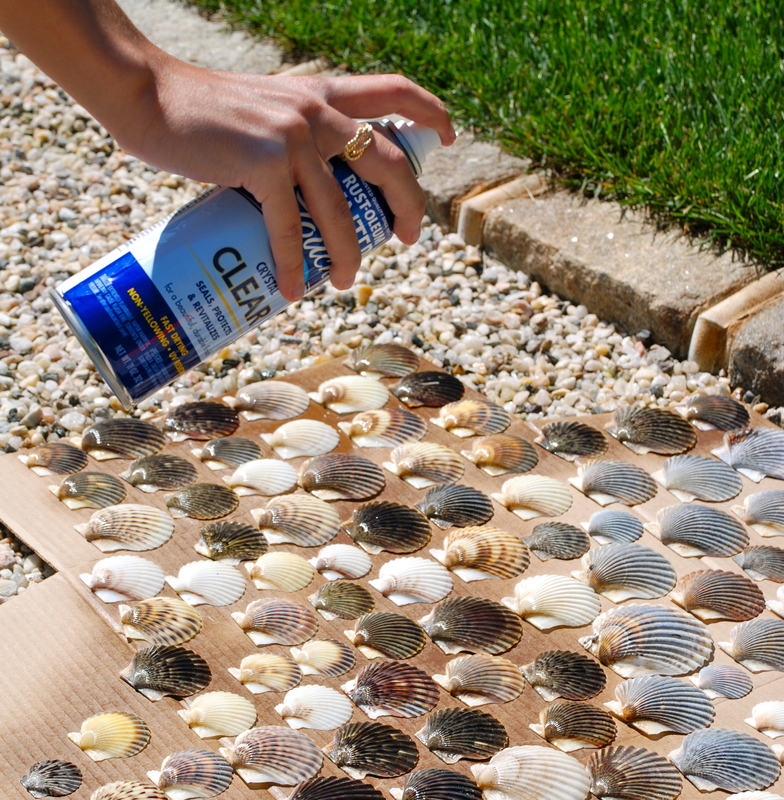 By spraying them with gloss, the beautiful natural color and pattern returns to the shell, after being covered up by sun and salt. 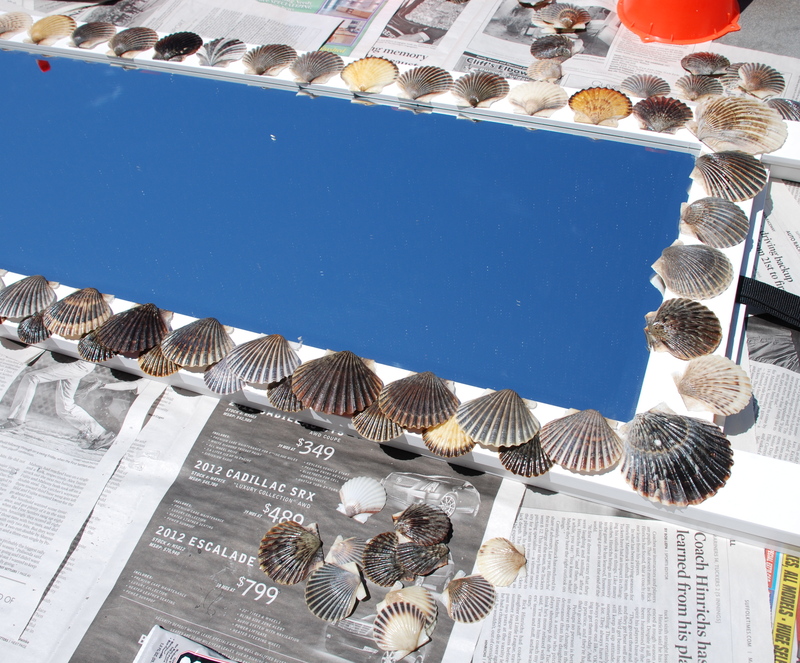 Then came attaching the shells to the mirror. For this I used E6000 craft glue. This is a great glue for crafting. It’s EXTREMELY strong and will hold your project together indefinitely. I created a shell pattern that involved three layers. I won’t lie, it took many hours between the two of us to get the whole thing done. 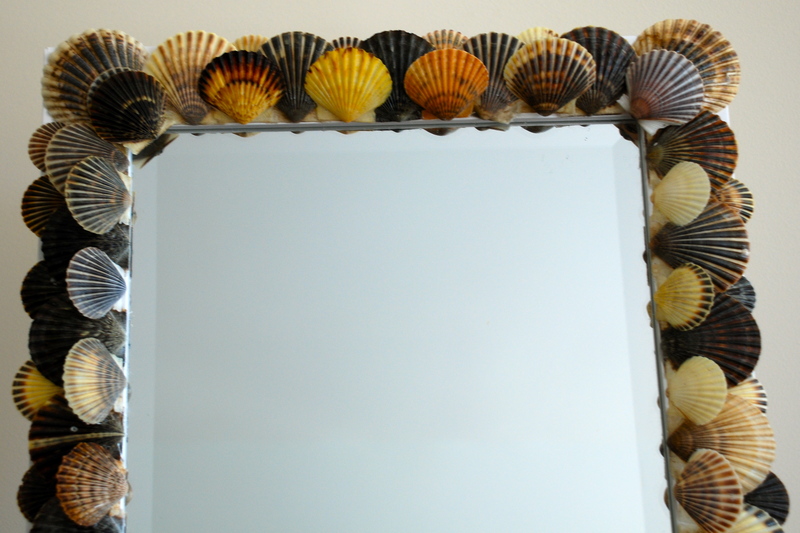 Finally, I visited the local marine supply store in my town to find natural manila rope to trim the edge of the mirror, and attached that with the E6000 glue as well. I am SO happy with how it came out. It was painstakingly hard work, but it really is beautiful, and well worth the time and effort. I couldn’t have done it without the help of my daughter, as she really is a crafting queen. I hope you all enjoy it! 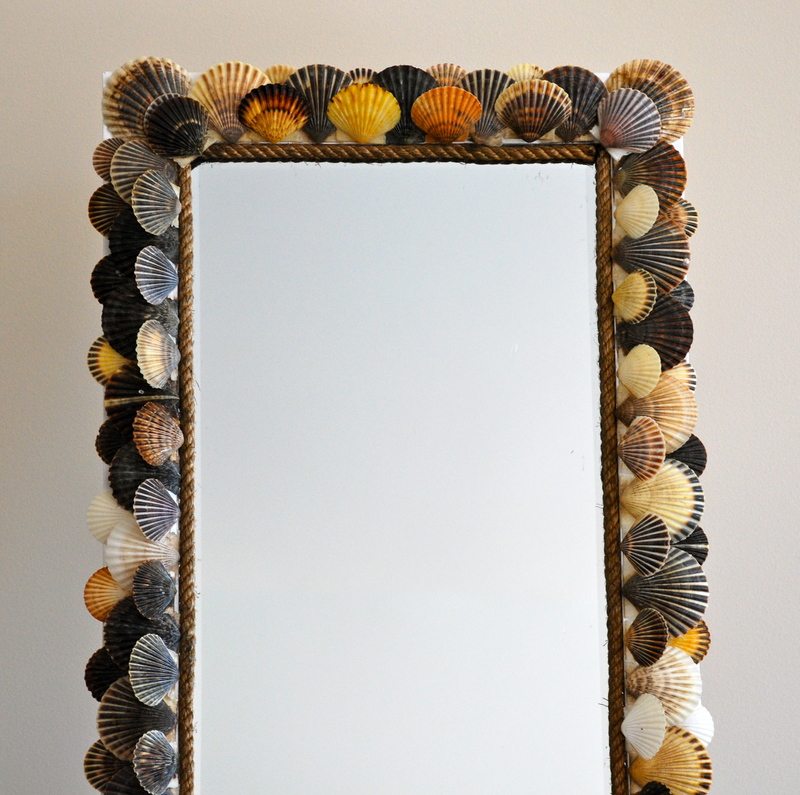 I’m happy to answer any questions to help you make your own scallop shell mirror. 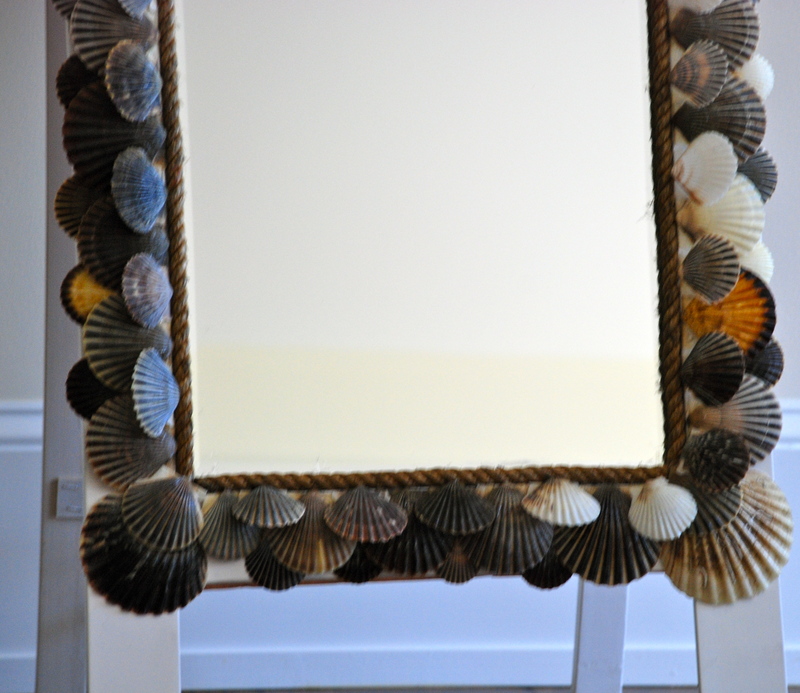 Mirrors can be your best friend when it comes to interior design. They can enhance your space, and if you’re dealing with a small space, give the illusion of a bigger area. 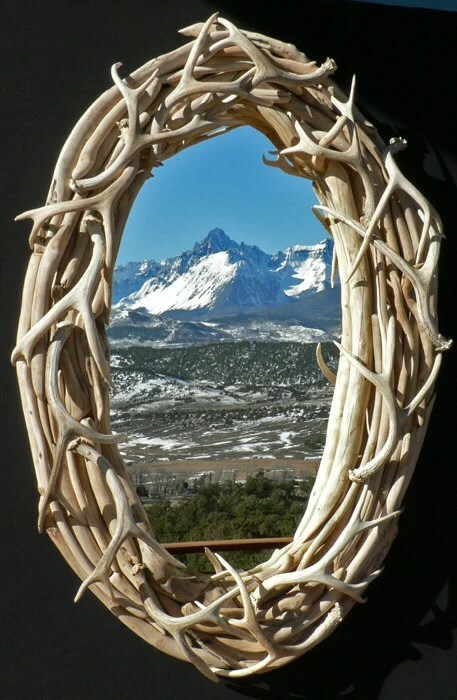 I love to use mirrors in my decorating projects. Finding the right mirror has never been easier as there are so many sources online and in home stores everywhere. 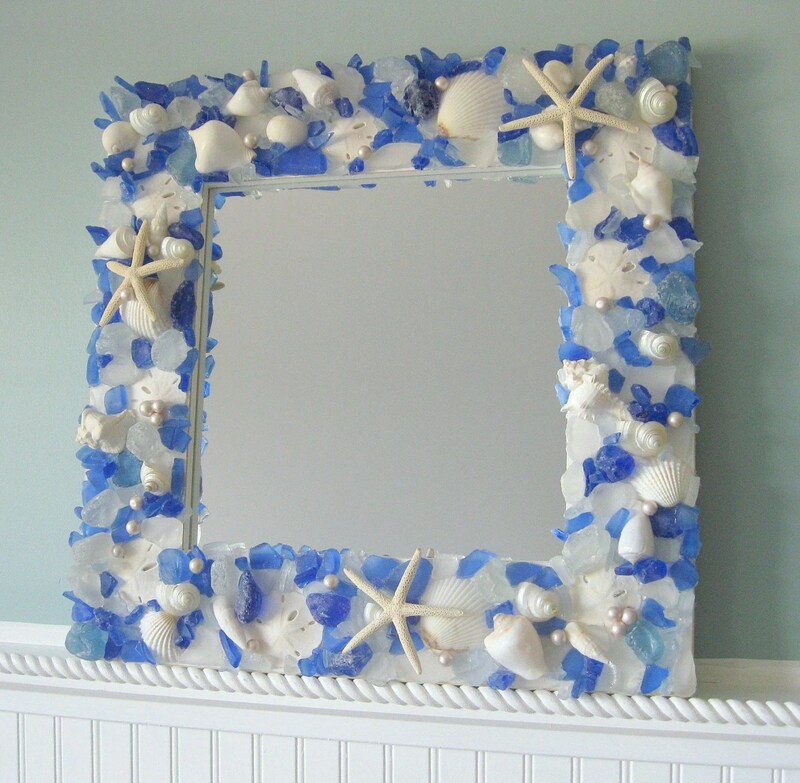 If you have collection of seashells, driftwood, sea glass or even starfish, you can easily create your own one of a kind mirror to hang in your home. If DIY is not for you then I have some great resources for you to check out to find just the right mirror for your interior design project! 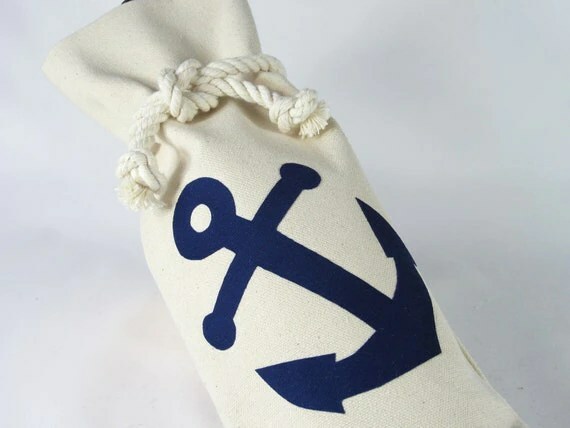 Adding anchors to your home or wardrobe is a great way to add a touch of nautical, without going overboard. It seems like everywhere I go to shop this season, I see anchors! Here’s some of my favorite anchor pieces this season. All are available online by clicking on the picture. Enjoy! Living on the East End of Long Island, I am blessed with the ability to wander the streets of the North and South Forks through an abundance of artists’ galleries. 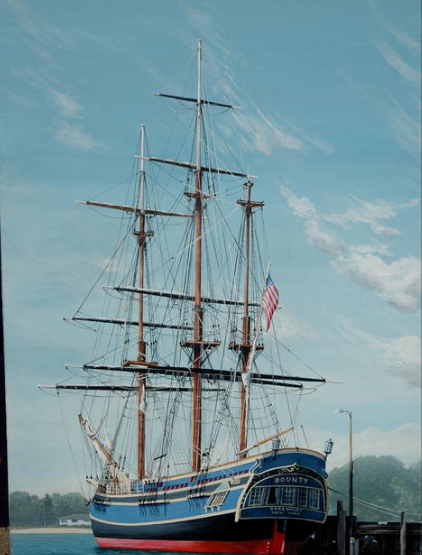 From abstract art, to oil paintings, to sculpture and watercolors, the East End has it all. I’m very particular when it comes to buying artwork, mostly, because art is an investment. 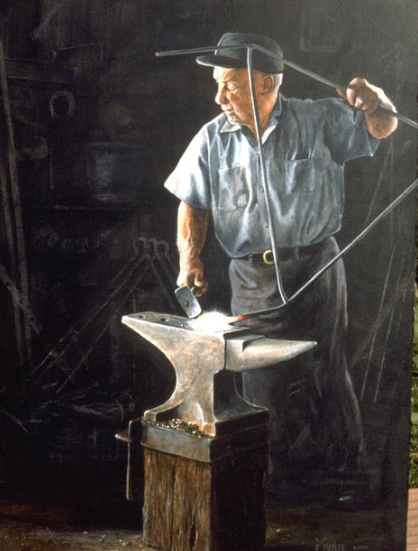 I look for a particular design and aesthetic when shopping for art, most of the time favoring classic painting techniques over modern or abstract art. When buying for the home, I search for pieces that are rich in color and make a statement on the wall on which they are hung. I also like to feel drawn into a painting, and feel like the place it’s showing is familiar, or like I can picture myself being there. 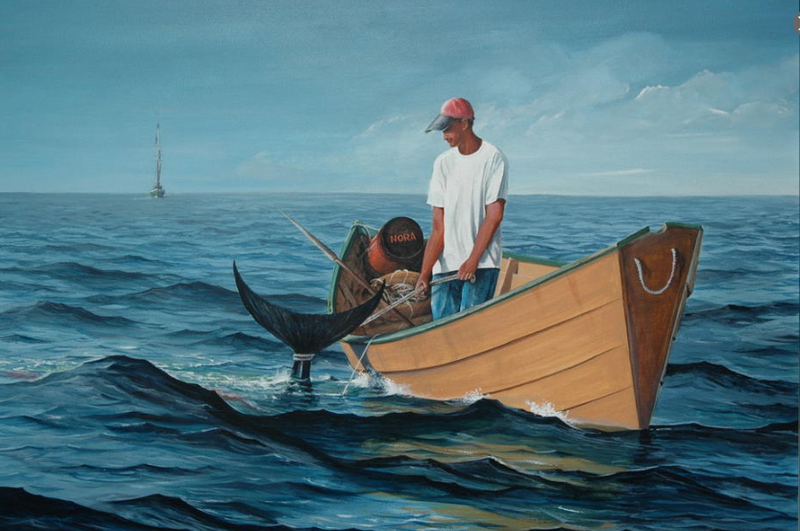 Richard’s paintings evoke nostalgia of life on the beach and at sea. I am inspired every time I walk into his gallery and see a new painting on display. His style is classical, historical, and highlights life on the East End. 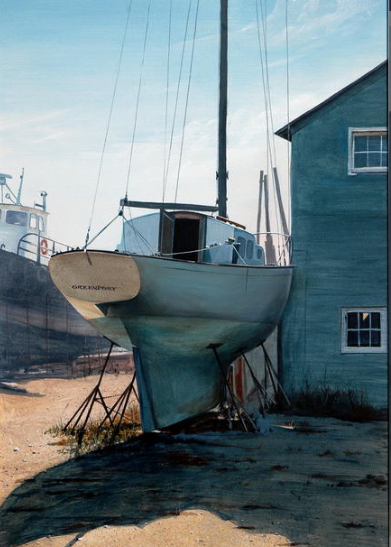 Richard’s paintings are the perfect accent not just for the coastal home, but for any style of decor. 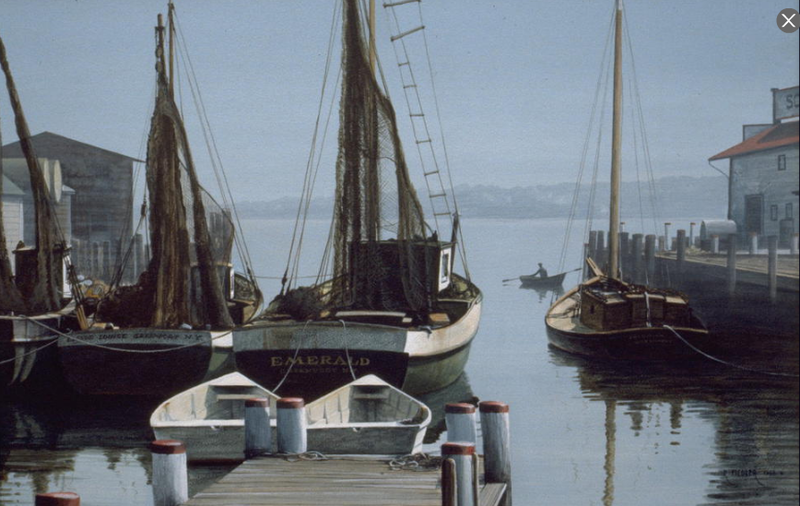 His subjects include landscapes, ships, wildlife, and more; there is certainly a piece for everyone. If buying an original is not in your budget, an affordable alternative is buying one of Richard’s signed and numbered prints, which are sold either framed or unframed. 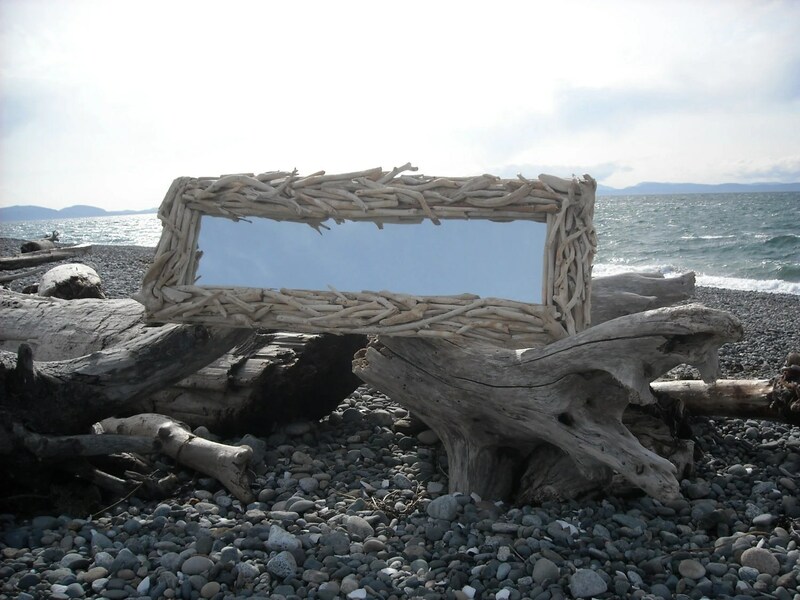 I tend to be partial to his framed pieces, many of which are made of recycled, weathered, barn wood. I’ve bought several of Richard’s signed and numbered prints over the years, however my two favorites were acquired last summer. The first is of a bushel of steamers, the second, of a bushel of blue claw crabs. I bought both framed in barn wood, and am so happy with their addition to my home and art collection. Last year I bought two prints that I have hung in my home that I just love. 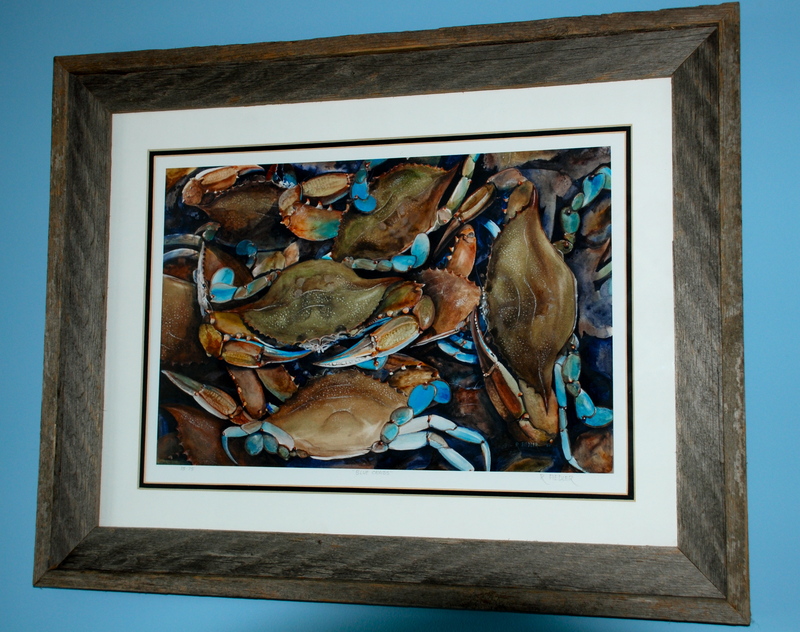 The first is of a bushel of clams and the second print is of a bushel of blue claw crabs. 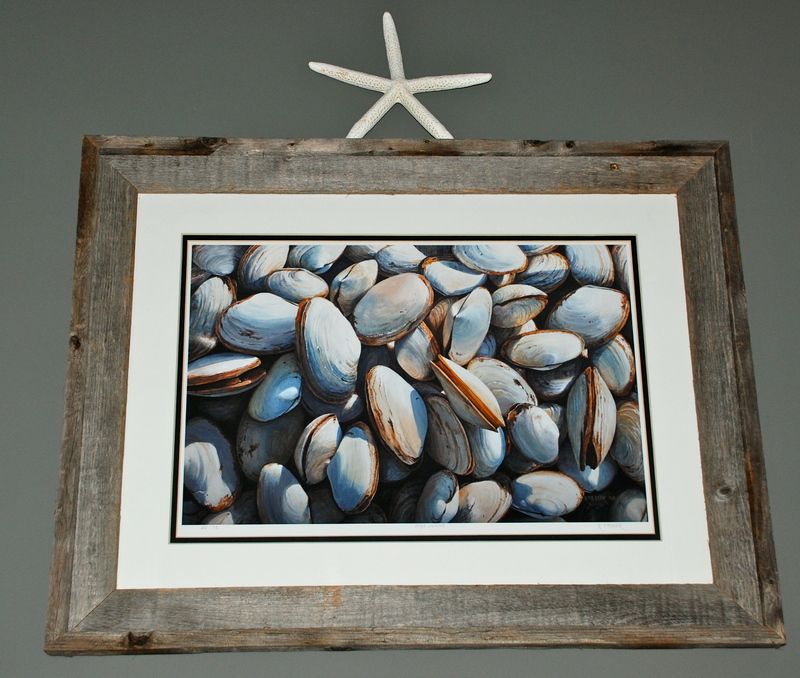 Both are framed in weathered barn wood that are perfect in any decor. 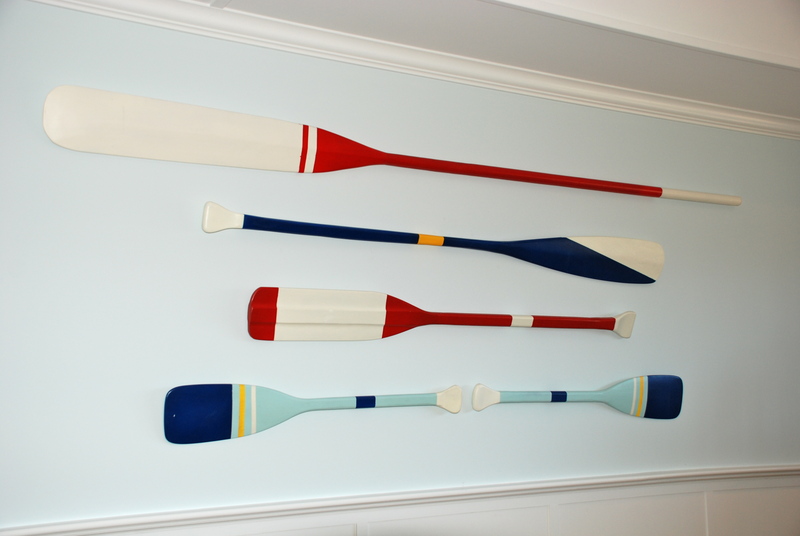 Nautical Wall Decor…Pottery Barn Kids! Finding interesting Wall Decor can be a challenge for many. 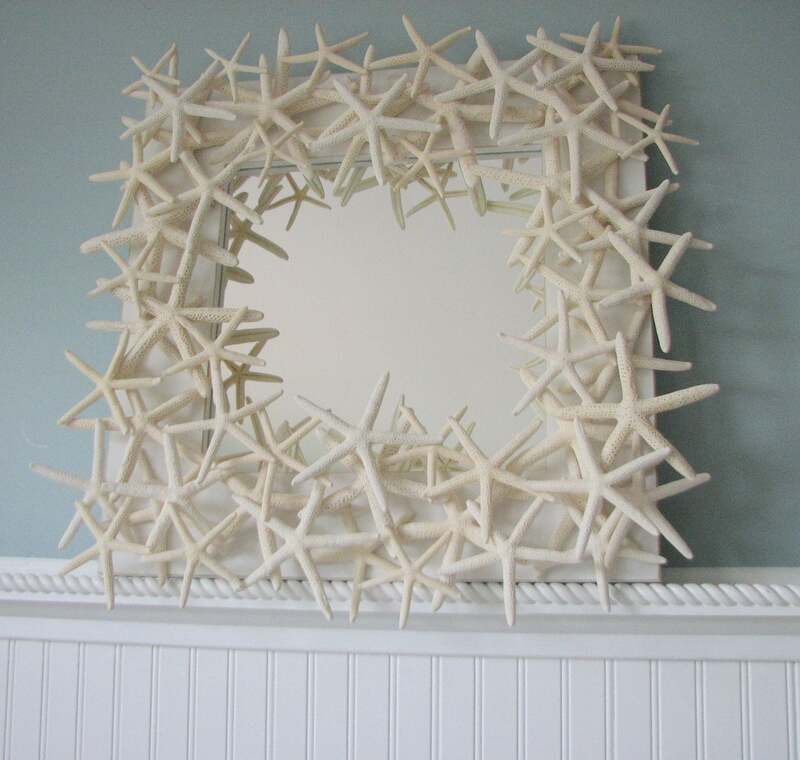 Believe it or not great place to look for coastal/nautical room decor is Pottery Barn Kids. Some of the most interesting and fun pieces I have found came from Pottery Barn Kids. 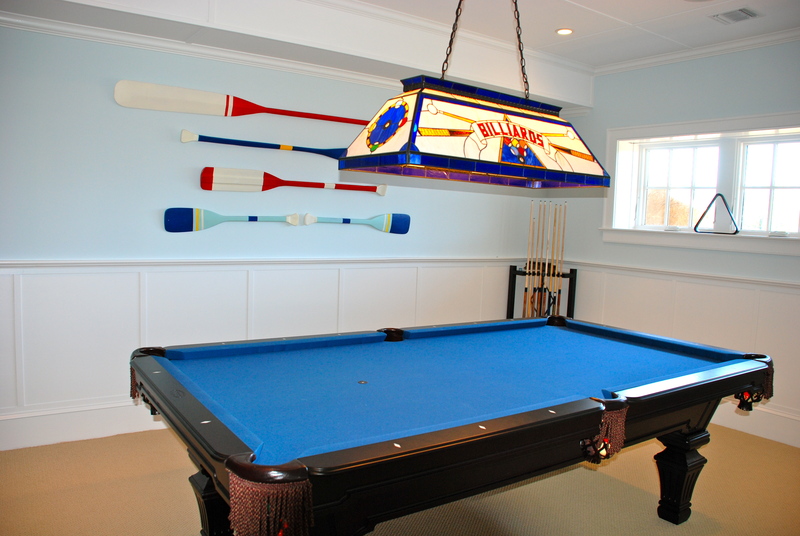 In trying to keep with a Nautical theme I purchased these colorful oars for a game room. 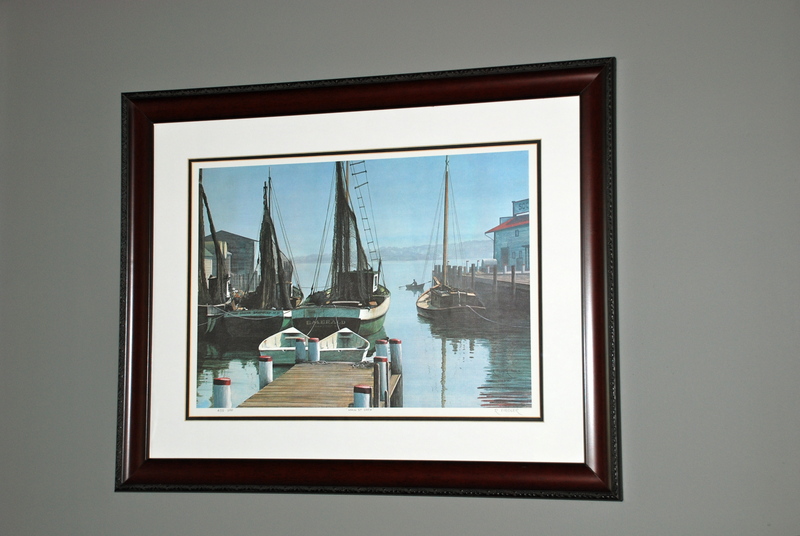 They were easy to hang and can be used either vertical or horizontal on any wall. They are great for a large space that is hard to fill or can be purchased piece by piece for smaller spaces. Pottery Barn Kids spring/summer 2012 catalogue has a great selection of Wall Decor perfect for any room in your house. Here are some of my favorites, all available at Potterybarnkids.com!